In this lesson, we will learn how to determine factors of a whole number and use this to solve word problems. Sameh is finding factor pairs of 42. Which number is missing from the table? Which two of these numbers are factors of 46? Is 6 a factor of 24? Is 3 a factor of 43? Find all the factors of 49. We know that 3 × 6 = 1 8 . Pick the true statement. A 3 is a factor of 18. B3 is a multiple of 18. C 6 is a multiple of 18. D 18 is a factor of 6. E 18 is a factor of 3. Fill in the blank: 5 is a of 50. Which of these is NOT a factor pair for 36? Farida is learning how to find factor pairs for numbers. These are pairs of factors with a given product. She makes arrays from 15 blocks to find the factors of 15. She sees that 1 and 15 are a factor pair, because their product is 15. 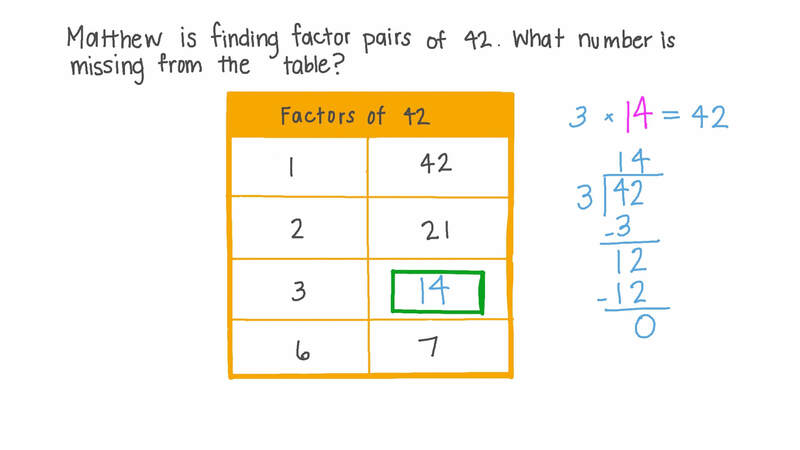 What is another factor pair for 15? Haya is drawing factor rainbows to show all the factor pairs for 20. She writes the factors in order from smallest to largest and draws an arc between each two factors in a pair. The green arc shows that 2 and 10 are a factor pair, since . Now it is your turn. Which of the following is a factor rainbow showing all the factor pairs of 24? Karim is finding factor pairs of 45. He has drawn a factor rainbow. 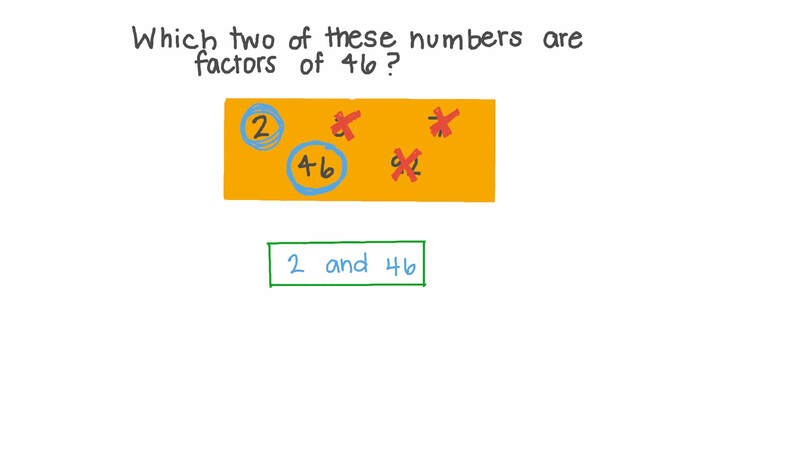 The factors are written from smallest to greatest and then the factor pairs are joined up. Which two numbers are missing? The measure of the area of a room’s floor is 143 area units. Which of the following dimensions can be the length and width of the room? Engy has 112 identical flowers that she wants to plant in rows in her flower bed. If every row must have the same number of flowers, how many different ways can she plant the flowers? Are all factors of 9 also factors of 18? Sameh is making arrays with 20 counters to help him find factor pairs for 20. He thinks that he has found all possible arrays. Can you find another? Which number is a factor of 14? Samar is finding factor pairs of 60. She has drawn a factor rainbow. The factors are written from smallest to greatest and then the factor pairs are joined up. What is a factor of a number? Which of the following is a valid way to divide 30 players into equal groups, and then share 180 game tokens equally between the groups? A2 groups of 15 players each with 90 tokens per group. B15 groups of 2 players each with 90 tokens per group. C2 groups of 15 players each with 36 tokens per group. D2 groups of 15 players each with 30 tokens per group. E5 groups of 6 players each with 30 tokens per group. What are the factors of the number 43? I am thinking of a number between 1 and 100. Use the clues to discover the number. It has exactly three positive factors. It is more than 30. It is less than 60. 27 has four factors. What are they? What number is a factor of all whole numbers? What is the largest factor of 24? How many factors does 93 have?